Select the range of hours you would like to display for each day of the week, select the starting date if you want dates included on the planner, and then edit the category titles to suit your needs. Once you have indicated your preferences, tap the "Create Planner Template" button. This will generate a customizable planner template and insert it into the section by the same name. To clear the hidden time block and note entries, tap the "Clear Hidden EntriesClear Hidden EntriesClear Hidden Entries and NotesClear Hidden Entries and Notes" button. Note that this will not effect anything stored in the calculator's database record (use the Actions button for that). Select the starting and ending time you would like included for each day of the week. If you would like dates displayed on the printed weekly planner, select the starting date. Otherwise, if you want the dates left blank then select "None" from the menu. Edit the title of each color to suit your individual event and activity types. All category-associated fields and menus will be updated as you make changes. Tap the button in this row to open a form for editing the title of each color to suit your individual event and activity types. Remember the 80 20 rule while naming your time blocks and planning out your weeks. Your goal should be to identify the 20% of your tasks that are yielding 80% of the results and then increase the amount of time you spend on those. After creating a blank planner you can use this section to bulk-fill time blocks that reoccur on a regular basis throughout the week. Tap the plus (+) icon to expand the section. Once you have entered the time block title, time span, fill days, and category, tapping the Add Time Block button will add category colors to the effected cells. To Undo a bulk fill, clear the title field, leave the time and day settings to the unwanted bulk fill, select the "Open" category, and tap the "Add Time Block" button. Note that you can also add time blocks to individual cells by tapping on the link within the cells, which will open a time block form for the selected cell. Enter the title of the time block you wish to bulk fill. Select the time block's to and from times. Otherwise tap on each day check box that is applicable to the time block you are adding. Select the category the time block will pertain to. This will add color to the chart based on the category titles and colors established by your preferences. After entering your preferences and tapping the "Create Planner Template" button the template will appear below this line (swipe up and down to view rows). Scroll down and tap the "Display Weekly Planner" button to print a blank planner. Expand the section above this one and add time blocks in bulk. Tap in any cell of the planner to open a form for adding time blocks to individual days and times.Edit day/hour cells one cell at a time. Tap any "N" (Notes) button to open a form for adding notes/goals to that day of week. Applies to desktop form only. Before entering an activity in the planner, click/tap the radio button indicating which category the activity will be applicable to. Clicking in a planner cell will change the cell color to the selected category. If you are printing a blank weekly planner template, leave this text area blank. Otherwise enter your notes/goals for the week and they will be included in the printable weekly planner. Incl stats?Include stats?Include stats on planner?Include stats on printable planner? Include stats on printable planner? If you would like stats displayed on the printed weekly planner, move the slider to "Yes". If not, move the slider to "No". This weekly planning template creator will help you to get more of what you want by helping you to focus the majority of your time on the activities that generate the greatest return for the time invested. 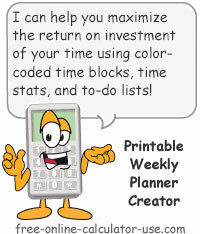 Specifically, this weekly planner creator includes a time-block inserter that will populate multiple cells of a weekly planning worksheet with any one of six color-coded, customizable, category time blocks. Plus, you can also choose to edit each day-time worksheet cell individually -- which can also be set to any one of the six time block colors. Or, you can leave the entire planning worksheet blank and simply print out blank weekly calendar pages to be filled in later. The planner maker even has notes and goals fields for each day and for the entire week. Also, this web app even allows you to choose which hours of the day are included in the planner -- making this tool just as valuable for those who happen to work late into the evening or who begin work in the wee hours of the morning. Select the daily time range you want the planner to include. If you would like dates included in the planner, select a starting date. Tap on the "Categories" button to edit any or all of the 6 color-coded category types. Tap on the "Create Planner Template" button to generate a scrollable table containing columns for days of the week, and rows for times of the day (1/2 hour increments). If you saved your work on a previous visit, your saved time blocks should be included in the template. At this point you can either preview and print a blank planner template (scroll down to "Display Weekly Planner" button), or add color-coded time blocks and notes/goals to planner. To bulk fill time blocks within the table, tap the "+" icon in the "Bulk Fill Time Blocks" line to expand the section. Or, tap within any cell of the table to add a time block to that cell. Tap the "N" (Notes) button at the bottom of the table to add notes and goals to individual days of the week. Then enter any notes and goals that pertain to the entire week. Tap the "Display Weekly Planner" button to preview or print the planner. Note that you can close the printable planner window and makes changes as often as is necessary to get the planner the way you want it before printing. Use the 80 20 Rule to maximize the ROI of your time. In case you're not familiar with it, the 80 20 rule or 80/20 principle is a mathematical formula that was formulated and used by Vilfredo Pareto (1848-1923) to predict the distribution of wealth within a society. Specifically, Pareto's law of distribution stated that 80% of a society's wealth was possessed by 20% of the population. However, Pareto also discovered that his 80 20 rule applied to many other types of measurable circumstances as well -- wherein 20% of the inputs yielded 80% of the outputs. As it applies to time management, the 80 20 rule basically means that 20% (or less) of your activities are likely responsible for 80% (or more) of the returns on your time. This means that the key to maximizing the return on your time is to identify the 20% of your time-consuming activities that are responsible for 80% of the returns, and then replace (delegate, outsource, eliminate, etc.) the lower returning activities (the 80%) with the higher returning activities (the 20%). This explains why I have included the color-coded time blocks with corresponding hour and percentage totals in the free printable weekly planner creator. Thanks to those features you can name up to six types of activities and then track what percentage of your time you are planning to allocate to each type. In my own case, one of the 20% activities that is largely responsible for 80% of my financial returns is creating unique and valuable content for this website. Therefore when using the time management tool on this page I use the color of money to represent "Content Creation" and then make sure my weekly calendar pages contain mostly green time blocks. However, I don't just insert them haphazardly. It's not enough to haphazardly add time blocks of 20% activities to your week planner. After all, if you add them in weekly day-time slots where you are easily distracted and/or often interrupted, the returns from your 20% activities could sink to the depths of those yielded by the 80% activities. For me, my most productive day-time slots are Monday - Friday between the hours of 7:00am (when the kids leave for school) and 12:30pm (when I get hungry and need a break). Therefore, not only do I fill those hours with 20% activities, but I also do whatever I can to shut myself off from "80%" interruptions (don't check my email, leave phone calls to my answering machine, etc.). The bottom line is, we all get 168 hours per week. But if you take the time to carefully plan and prioritize how you will spend your 168 hours -- paying close attention to the 80 20 rule -- you may just find yourself among the 20% that possesses 80% of the wealth.